I opted into the Docker for Windows beta which is a new approach to using docker on Windows and was announced in late March 2016. For those of you who have used Docker before you know how powerful of a tool it is. For those of you who have tried to use Docker on Windows before you know how difficult and quirky its configuration can be, mainly due to having to use VirtualBox to host the Linux VM which runs Docker (the docker-machine command is used to interact with the VMs running the Docker engine). This meta-layer of management goes away with Docker for Windows because while the Linux VM still exists it utilizes Hyper-V on Windows and basically deprecates the use of docker-machine . The team working on Docker for Windows has also been spending a lot of time ensuring the application can handle all the various hurdles that would normally lead to hours of configuration tweaks and debugging systems a developer isn't familiar with. When I got my Docker for Windows activation code for the beta I instantly installed it and instantly ran into problems. I wasn't bothered by the fact that I was still spending hours doing the exact thing I was trying to avoid by using Docker for Windows instead of the Docker Toolbox because I knew it was still in beta and I was being given a chance to help diagnose these problems so that future developers wouldn't need to. I've been participating on the Docker for Windows forums and getting a great response from the support staff. The community there seems pretty friendly and helpful - everyone there wants to see this work for everyone. Despite all these issues, Docker for Windows is now at a point where it works well enough on my home PC and work Macbook that I can download images, start/stop/delete containers and map to volumes. This means my inner-loop for development tasks is pretty quick and I could see myself using docker as part of my workflow now. So now let's get to the fun part - seeing what cool benefits a developer can get from containers. We are going to make a NodeJS Express app that runs within our container but serves up files on our local file system. Why would we want to do this? Well imagine, as a web developer, that you want to do some coding to try out a new framework, build a proof of concept or just mess around with something you think is cool. Web development always requires a web server, sometimes needs a database and always needs these things configured if you are going to use them. What's that? You don't like configuring web servers and databases? You don't love spending sunny days indoors restarting Apache or Nginx, MySQL or MongoDB hoping your configuration tweak finally brought your celestial sphere of web development into alignment so that you could finally write a single line of code? Yeah, I don't either! Containers can give us those environments, application stacks and tool chains pre-configured so that we can jump straight into development. In addition to this, the containers can also be started, stopped, deleted and re-created without affecting our application code and without forcing us to worry about permanently messing up configuration on our host system (Oops! Did I just delete that environment variable I need for my other application trying to get this one to work?). Let's run some commands[1. Some of this demo was inspired by Dan Whalin's amazing course Docker for Web Developers over on Pluralsight]. 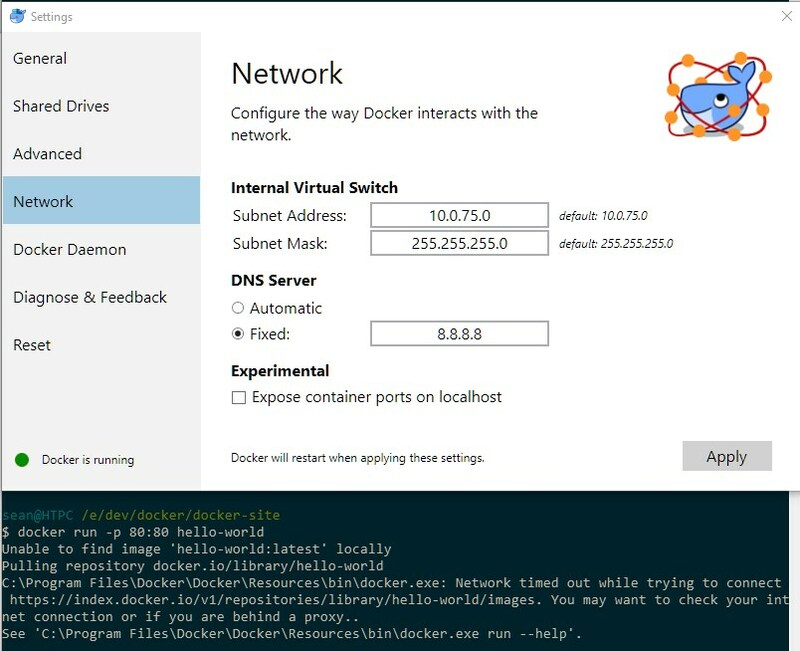 You will need to be in the Docker for Windows beta, install and activate the application. Then make sure, NodeJs and Visual Studio Code are installed locally. Open up your console (I'm using ConEmu with Git Bash) and make sure express and express-generator are installed. Maps a volume (directory in this case) from the host to the container. The container will see any changes I make to my local directory as changes to the directory I specify in the container and vice versa. When using Git Bash we have to prefix unix-style paths with an extra / to prevent Git Bash from expanding them to Windows paths. In the above command I am mapping my local E:\dev\docker\docker-site folder to the container's /var/www folder. Sets the working directory inside the container for any commands to be run when the container starts. Here we are running //bin/bash command from the //var/www directory. Now reload the browser to see the requested files logging to the container's terminal again. If you want to stop the express app, use ctrl+c and then ctrl+p, ctrl+q to again exit out of the container terminal without stopping the container. I hope this helps in understanding the purpose and significance of the new Docker for Windows application and Docker/containers in general. I've had a lot of fun (mostly!) exploring containers and I look forward to the official release of Docker for Windows and the release of Windows Server 2016 later this year, which will have native Docker support. I can see Docker containers becoming a regular part of my web development tool belt, especially in the .NET world with the new modular and cross platform .NET Core framework. In Part 2 of this series I plan to look at building a ASP.NET Core Web Api app in Windows and deploying it to Windows Server 2016 as a Docker container.